Bonjour et le séjour? Daily greetings in Africa are more jovial than in Europe. Strangers automatically ask about your day, your health or your family. It gives every conversation a personal touch. The vibe in Africa suits us well. The rain season brings the much-anticipated rain now and then. Every day is very different, which keeps our internship interesting. The end of the project comes nearer every day, but more about that later. 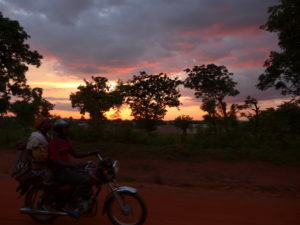 During our time here, we understood that the farm of Sokounon is a place of coming and going. Now that the local interns and the Belgian scouts are gone, the place became much quieter. Nevertheless, we enjoy the peacefulness of this place the most we can! 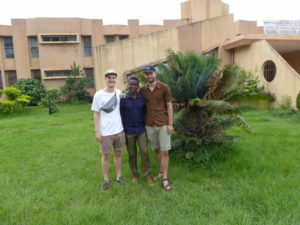 The Beninese and the Belgian interns. 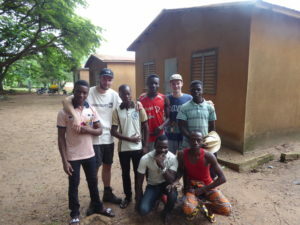 During the weekend, we went to visit the university of Parakou with the bio-engineers who did their internship on the farm. The vacation hasn’t started yet as there was a strike amongst the teacher which lasted for five months. This means that they have some catching up to do. The campus consists of our faculties: law, medicine, agriculture and economy. Everything was in a main area in the city. It seemed like a progressive university with a lot of wonderful African architecture. Too bad they don’t have the same equipment as our universities, but the students’ motivation compensates this in a fair way. During our visit, we noticed a lot of students organising activities such as sports, theatre groups and small bands themselves. In the end we got invited to the prom of the bio-engineers tonight. We are looking forward to it! For such an event an appropriate outfit is a must. Luckily, we are prepared for this. On the local market we went to buy tissue for local clothing. In the shop we went, there was an abundance of colourful cloth. The goal is to pick a tissue you like, go to the tailor, who makes a custom-made outfit out of it. 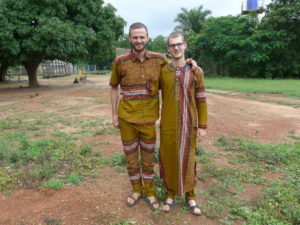 Arno picked a Beninese shirt and pant, while David went for the Nigerian ‘Bumba’. On Sunday we had the occasion to show off during the Sunday Mass. 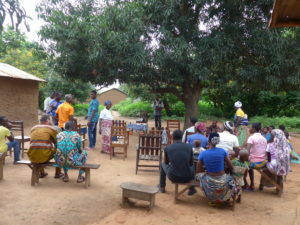 Frère Vincent held the service this time in Atagara, a young parish which didn’t have a church. Therefore, the altar was constructed under a mango tree. The choir was accompanied by drums, while everyone clapped in their hands. A special experience! Later that day we went to the Grillardin with the other Belgians, which gave a nice finishing touch to our weekend. 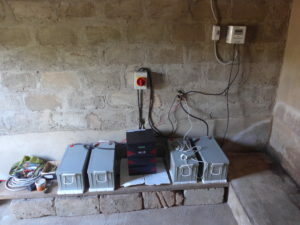 After a year of preparation and a quest for components which lasted two weeks, we finally got to install the PV-installation. Because we prepared everything on beforehand, this should’ve taken only one or two days. 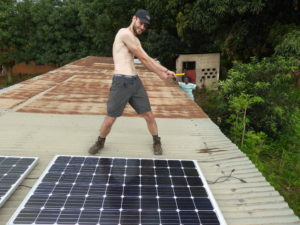 But as with every project, it went a bit different… On the first day we planned on fixing the solar panels on the mounting rack and then we wanted to mount the rack on the ‘roof’. The racks, which we designed ourselves some days before, were weld at a local welding station. Because the roof was oriented to the south with the right inclination, the design wasn’t too complicated. 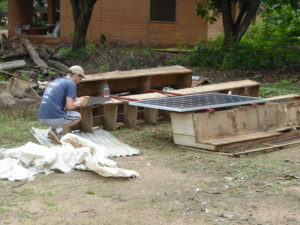 We just had to make sure that the solar panels were firmly fixed and that the rack wouldn’t fall of the roof. With the right materials this would be an easy job. So far, we were used to have every tool at our disposal in our homes at Europe. Here it was a task on itself to find the right head for a drill or the right wrench. 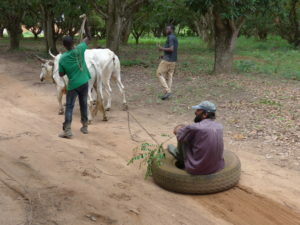 Work could be more efficient, but after all it’s part of the African adventure. At this moment the electrical circuit is almost done and there is only some finishing work left IF everything goes according to plan. Next week we’re planning a trip to visit the North. We want to visit the national park of Pendjari, the waterfalls of Kota and the Tata Somba’s. Our next post will contain our adventures in the North! 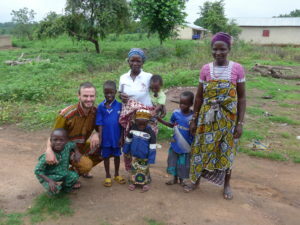 Greetings from Bénin!